Plants that grow in water are referred to as Aquatic Plants, these plants range from ornamental, flowering and foliage plants to water plants used oxygenating dams and ponds as well as for erosion control. They can be grown in ponds, dams, water features and tanks as well as wet and boggy soils. Some grow in the water itself, others in the margins of ponds and dams where they receive consistent moisture. These plants are generally defined by the depth of water they grow in or how they grow. Marginal plants grow near the edge of ponds and dams. Deep water plants are fully submersed many with floating leaves and flowers. 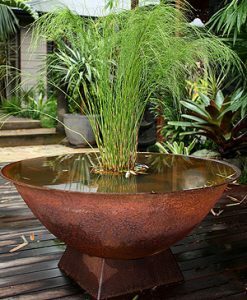 water features it is essential to look at the plants suitable for growing water in a garden situation. The important aspect is to select plants suited for situation and especially in terms of the type of water we are looking at, moving water requires different plants to ponds and boggy areas. 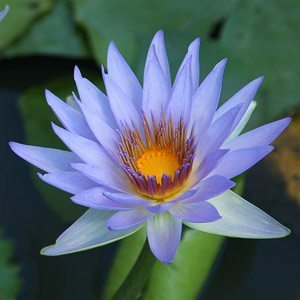 Some water plants are grown for ornamental reasons, these include Water Lilies, Lotus, as well as some rushes and reeds. Plants such as Gunnera manicaata are grown for the foliage, while others such as Rodgersia and some Iris are grown for the flowers. Native aquatic plants to provide habitat for native wildlife as well as being suited to local conditions and this is true, however many exotics will actually serve the same purpose. Plants that will grow in water include, exotic water garden plants, pond plants and native Australian water plants. With each type many reasons for growing them become apparent. Growing water plants is a great way to oxygenate water and provide a habitat for fish. Deep water plants grow with their roots totally submerged. Aquatic cannas (canna glauca) are an attractive flowering canna that grows well near the edge of a pond. They look great in small clumps. Tall growing to nearly 2m aquatic cannas make great features. Alocasia amazonica, Alocasia marcrohizos, and Colocasia esculenta are three marginal water plants grown for the foliage. Cyperus prolifer is a dwarf papyrus that does well in marginal positions. Fringed water lilies such as Nymphoides geminata and Nymphoides crenata are attractive flowering water plants. Water Irises include the well know Louisiana Iris, a group of plants from the marshes of Southern North America. This group actually includes 5 species that have been extensively bred to produce what we now cal ‘Louisiana Iris’. Species include Iris, brevicaulis, Iris giganticaerulea, Iris fulva, Iris hexagona and Iris nelsonii. Japanese water Iris ( iris laevigata) and English water Iris ( iris psuedacorus) as well as the Blue Flag Iris (Iris versicolor). The southern blue flag iris is Iris Virginica while Iris ensta is another Japanese species used widely in ornamental fish ponds.